"For if the trumpet give an uncertain sound, who shall prepare himself to the battle?" The latest poll from MQO is being reported as a statistical tie by NTV , while CBC says it shows a "neck and neck" race between the PCs and Liberals. That's not really the story of the polls, though and what they might mean. Here's the pretty chart showing every party choice poll result since 2015 (except for Mainstreet*). Now here's what it shows. Remember that when you are looking at some of those apparent big jumps, we are actually only talking one or two percentage points in most cases. You are also looking at different results from different polls so sometimes the jumps up and down are just the natural difference between one poll and another, not an actual change of opinion. Take the green dotted line, for example. It's the undecided/won't vote/no answer responses. Those spikes where it hits 40% are MQO. The slightly lower spots are mostly CRA. Most polling firms drop these responses from their poll reports but around these parts, people who make this choice are offering a valid response to the question and it means something. Ask any veteran campaigner and they will tell you that at the doorstep "undecideds" are people voting for the other guy but who are too polite to tell you to your face they don't want you. For polling firms, your humble e-scribbler is going to suggest that what they really saying is that they like none of the above. You might be able to tease a preference out of them but their first answer is probably closer to their real feeling. "Undecided" means that they really don't like any of the choices. Now look at the green line. From about the middle of 2017 it has been pretty consistent. The peaks are actually MQO so their polling gets a fairly consistent answer. Same thing for CRA which is the number in the mid 30s. Average 'em out. Rock steady. The largest single group in any recent poll are people who don't like any of the parties as they currently stand. If you head into an election right now, the view in this corner is that most of those people likely won't vote. This will be a low turn-out election. Neither of the parties has done anything to appeal to voters generally. They are just talking to their core. That might change but right now, it looks like low turnout. In early 2016, the NDP was on top of the polls. But look at that long slide downward that finishes with MQO having them in the single digits in this poll. At that number, the NDP will struggle in metro to hang onto their two seats. Lorraine Michael likely won't run but if the NDP can field someone like St. John's deputy mayor Sheilagh O'Leary they have a shot at holding the seat. But otherwise, they will have to focus on keeping the party leader in the House in the sole NDP seat. The PCs will be get the benefit of that slide. MQO vice president Stephen Moore told CBC that the PCs seem to be picking up the NDP losses. Well there's no maybe in it. Over the past decade in metro, PC and NDP trade voters back and forth more often than either trades them to Liberals. So with the NDP weakening, that's bad news for Liberals on the Avalon, especially around town. MQO also shows the Liberals trailing the PCs east of Goobies. Basically that means in every seat on the Avalon, the Tories have the edge already. 44% of the people polled by MQO said they think things are worse now than they were three months early. Another 44% said they felt things were the same. But if you track back through polls, you don't get the sense anyone is feeling that the province has turned a corner. People are not happy. Some are petrified. But most are scared. They are scared of Muskrat Falls. Not scared that their electricity bills will double. The shock of that is gone. What frightens people now is the realisation that after three years of promises, the politicians have no idea what to do except make more promises they cannot keep. Doesn't matter the party. Liberal and Tory alike have no idea what to do but yammer. Some Liberal political genius thought that the Muskrat Falls inquiry would remind everyone of the Tories who created the mess. There was no problem running an election campaign at the same time as the hearings. Only Tories will get burned. Surprise! The inquiry has flung napalm across the political landscape. It's sticks to any flesh it touches, regardless of political stripe, searing and destroying. As in 2016, people did not need to hear in the budget, yet again, there was a financial problem. They knew there was a problem. They needed to hear a solution or at least have confidence someone could find an answer. They did not hear a solution and so they got mad at the politicians. The Liberals dropped further in the polls in 2016 after the budget than any party since we have had polling in this province. Three years later, they know Muskrat Falls is a problem. They know the Tories did it. But they have nothing of a solution, just silly promises that no one will pay or Ottawa will pay. Childish promises that no one believes. That is why they are frightened. Politicians better hope the voters don't get mad this time. Your humble e-scribbler would bet dollars to doughnuts that fear is what has been driving those "Undecided voters" to the margins and generally keeping the Liberals and PCs so close together for months. If that fear turns to anger,there is no telling what might happen. If some half-ways credible group of candidates emerged with a leader, there is no telling what might happen when there is so much jellied fuel oil laying about just waiting for a spark to light it. Muskrat Falls will continue to dog both leaders and their parties. Until they come up with a decent answer, you can expect the polling numbers to be weak and the likely voter response will be to stay home. That does not mean there will not be drama. Craig Westcott has some thoughts on the dramatic change that 2019 might bring. The MQO poll fits. *A note on Mainstreet: Mainstreet's last poll is consistent with the MQO finding even if the numbers don;t match up. 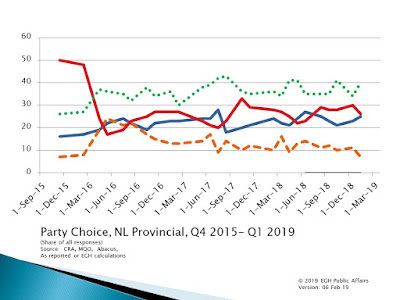 Mainstreet's January poll showed the Liberals and Tories neck and neck at 36/35 with a UND of 17 points. That's actually 10 points above where MQO and other polls has them and the UND is less than half of the average of other polls. Because of that discrepancy, we've left them out of this tracker. Mainstreet saw the same dead heat MQO did but the numbers don't fit. WHEN DOES DECEPTION BECOME A CRIME? Write for the RHS Historical Transactions Blog! Which Oxford prime minister was the best speaker? Kremlinology 43: We love the Leader! Kremlinology 28: How will he go? Kremlinology 20: Who will replace Danny? Kremlinology 11; Words that start with "p" and "o"
Copyright 2005 - 2015 by Edward G. Hollett. Picture Window theme. Theme images by billnoll. Powered by Blogger.